The browned butter must be brought back to room temperature for this recipe, so it must be made a bit ahead of time to allow it cool. In a medium bowl [I just use a 4 cup glass measuring cup], mix together the rhubarb, ⅓ sugar and cinnamon. Set aside. To brown the butter, place it in a 2 quart sauce pan and melt over medium heat. Leave on medium heat, and continue to cook [it will sort of simmer], stirring every 20 seconds or so, or swirling the pan so it cooks evenly. The extra liquid will gradually cook off, leaving behind just the fat, which will then begin to brown. Once it begins to brown, stir or swirl constantly. You want it to get to a nice nutty color, so be patient and watch it carefully - the closer it is to done, the more easily it will burn. Once browned, scrape it into a small dish to cool, making sure to get all the browned bits from the bottom of the pan. When the butter is at room temperature, place it in the bowl of a stand mixer, or a regular mixing bowl, if using a hand mixer. Cream the butter briefly, and then beat in the sugar. In another small bowl, whisk together the flour, salt and baking powder. Add the flour mixture and buttermilk or yogurt alternately, beginning and ending with the flour. Don't overmix - just beat in each addition until it is nearly incorporated and then add the next one. after the final addition, turn off the mixer, scrape the sides of the bowl with a rubber scraper and give it a few good folds to make sure everything is evenly mixed. Spread half of the batter evenly in the prepared pan, getting right up to the edges. Give the rhubarb mixture a good stir and spread it evenly over the batter, along with all of the syrup that will have formed. Spread the second half of the batter evenly over the fruit - if there are a few places that don't get completely covered, it will be fine. Bake for about 50 minutes - maybe even as much as 60 minutes. A toothpick inserted near the center should come out clean. If you look carefully, you will able to tell the difference between cake batter and the juices from the rhubarb - juices are okay, batter is not. In this case, it's better to err on the side of too done than not enough. 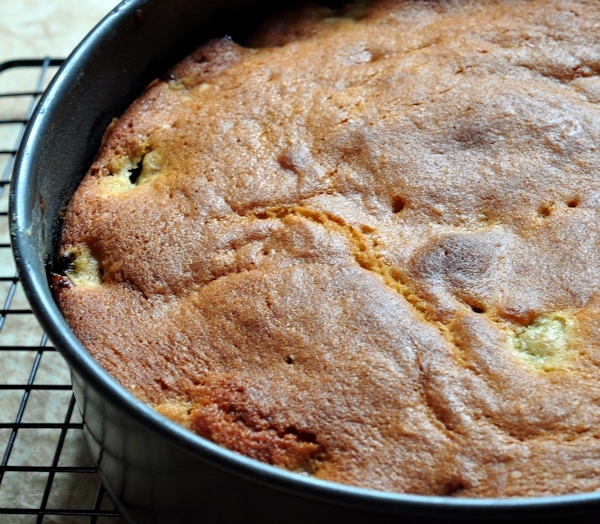 Remove cake to a cooling rack, and after a few minutes, loosen and remove the sides of the springform pan. If you use parchment paper, you will probably be able to slide the cake right off the pan bottom which will help it cool a little more evenly. Serve warm or cooled, plain or with a sprinkle of powdered sugar, some lightly sweetened whipped cream or vanilla ice cream. Refrigerate leftovers.